The Braves have announced that closer Arodys Vizcaino has undergone season-ending shoulder surgery. The procedure involved a labrum clean-up and the removal of scar tissue. This news represents a major hit to a Braves relief unit that was already under fire. That’s true of many other clubs — including several division rivals — but that doesn’t make it easier to bear. A.J. Minter, the club’s other top option for the ninth inning, has scuffled out of the gates. Others in the bullpen currently include Wes Parsons, Luke Jackson, Jesse Biddle, Shane Carle and Chad Sobotka, although of that bunch, Carle and Sobotka have struggled quite a bit in the season’s first few weeks. The Atlanta organization isn’t short on promising arms in the upper minors, though the bulk of their top-regarded arms are in rotation roles. Bryse Wilson and Kyle Wright opened the year in the big league rotation, in fact, though each has since been optioned down to Triple-A Gwinnett. Southpaws Luiz Gohara and Kolby Allard are both starting at the Triple-A level as well. Right-hander Mike Soroka, arguably the most promising young arm the Braves have in-house, didn’t appear to be an option in the hours leading up to the news on Vizcaino’s shoulder. To the contrary, Mark Bowman of MLB.com tweeted that afternoon that it’s likely that Soroka will be recalled to start tomorrow’s game for the Braves. He’ll at least temporarily step into a rotation that is expected to get top starter Mike Foltynewicz back by the end of the month. It won’t go unnoticed that there is still a rather prominent free agent reliever still left unsigned. Long-time Braves closer extraordinaire Craig Kimbrel held talks earlier in the winter but failed to come to terms with the value-conscious Atlanta organization. He’s still reportedly seeking a multi-year deal; the Braves will be loath to commit to a lengthy accord, but Kimbrel’s leverage may be on the rise as late-inning relief units falter around baseball. Signing Kimbrel before the June draft would cost the Braves a pick in the 2020 draft, as Kimbrel rejected a qualifying offer from the Red Sox upon conclusion of the 2018 season. Nevertheless, the on-paper fit is now more pronounced than ever, and fan outcry for the organization to broker a reunion with an already beloved franchise icon has been audible since late in the offseason. The Braves kicked off the winter with a high-profile signing of Josh Donaldson but then went largely dormant, negotiating only small-scale returns for Brian McCann and Nick Markakis. At the time of the Markakis signing, general manager Alex Anthopoulos spoke of the contract’s below-market rate perhaps giving the team flexibility to make further moves down the line — in addition to Braves leadership already having spoken of increased spending capacity earlier in the winter — but that has yet to come to fruition. As for Vizcaino, the injury may well prove to be the end of his Braves tenure. The hard-throwing righty entered the season with five years, 168 days of Major League service time, meaning he’s already now surpassed the six-year service mark needed to qualify for free agency. Perhaps the Braves will look to retain him on a bargain contract next offseason, but Vizcaino will have the ability to listen to offers from any and all interested parties. He’ll quite likely be forced to settle for a one-year deal with a low base salary and plenty of incentives, if not a minor league contract, as teams throughout the league look at him as a potential bounceback candidate. He won’t turn 29 until November, though, so at the very least, Vizcaino will have age on his side in free agency. The Braves announced today that they’ve placed southpaw Jonny Venters on the 10-day injured list. He’s dealing with a strained calf, though his struggles likely played a role in the timing. Venters made a miraculous return to the majors last year after five full seasons away owing to a brutal run of arm injuries. He pitched well enough to be tendered by the Atlanta organization. But Venters struggled this spring and has continued to do so through six regular-season appearances, over which he has surrendered six earned runs in just 2 2/3 innings. Todd Frazier has a good chance of making his season debut later this week, per MLB.com’s Anthony DiComo (via Twitter). The Mets third baseman missed the first couple weeks of the 2019 season with a left oblique injury, but he’s on the return trail and could join the team in Philadelphia. J.D. Davis has had his share of moments while playing third in Frazier’s stead, batting .242/.375/.485, including a home run on April 6th – with an exit velocity of 114.6 mph – that was the fourth hardest-hit HR by a Mets player since Statcast started tracking the data in 2015. Both of his home runs this season came in that April 6th contest against the Nationals until he hit his third tonight against the Braves. Given the way Pete Alonso has played at first base, the Mets will face a roster crunch when Frazier does return. Dominic Smith, Luis Guillorme and Davis all have options remaining, making them notably vulnerable. Braves righty Mike Foltynewicz will make his final scheduled rehab start this week before likely joining the Braves rotation for his 2019 debut, per The Athletic’s David O’Brien (via Twitter). Folty enjoyed a breakout 4.2 rWAR 2018, going 13-10 with a 2.85 ERA over a career high 31 starts. The stellar results were driven by year-over-year improvements in strikeouts per nine innings (from 8.4 K/9 to 9.9 K/9) and home runs allowed per nine (from 1.2 HR/9 to 0.8 HR/9). Both his fastball and sinker gained a full mph or more from 2017 to 2018, while he also relied more heavily on his slider, which excelled as a wipe out pitch (36.8 Whiff%, 42.4 K%). Sean Newcomb’s recent demotion opens up a spot in the rotation, as Monday’s day off will allow a four-man rotation until Folty is likely to return. 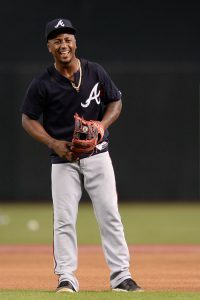 The Braves continued to lock up their core pieces Thursday, announcing a contract extension with second baseman Ozzie Albies that’ll guarantee the 22-year-old a total of $35MM from 2019-25. He’ll earn $1MM apiece in 2019 and 2020, $3MM in 2021, $5MM in 2022, and $7MM annually from 2023 through 2025. The contract includes a pair of club options reportedly valued at $7MM apiece; the first one comes with a $4MM buyout. If both are exercised, Albies will earn a mere $45MM over the next nine seasons — four of which would have been free-agent years. Albies was already under control through 2023 but will now join Ronald Acuna Jr. in comprising a core that the Braves can build around beyond that point in time. Acuna’s contract was deemed by many to be bargain, but the Albies deal runs nearly the same length while checking in at just under one third of the total maximum value. In terms of overall guarantee, Albies topped fellow second baseman Ketel Marte, though he did so only by giving away additional years of control. Historically speaking, there’s little to no precedent for a player this young and of this caliber surrendering four would-be free-agent seasons for a maximum payout under $50MM. While there’s surely something to be said for accepting a first life-changing payday — particularly with arbitration still two years away — Albies was on track to become a free agent upon completion of his age-26 season. For comparison’s sake, Scooter Gennett earned $18MM over this three arb years despite not breaking out until he was in his first arbitration season. Jonathan Schoop, who was non-tendered after his second arbitration season, signed a one-year deal with the Twins and will earn $19.475MM across what would’ve been his three arb seasons. Setting aside second basemen and merely looking at players who signed extensions with between one and two years of Major League service, Christian Yelich (seven years, $49.57MM), Andrelton Simmons (seven years, $58MM) and Anthony Rizzo (seven years, $41MM) all topped the Albies guarantee handily — and did so more than four years ago. If Albies was dead-set on an extension, a $50MM baseline would have been at least commensurate with market trends — especially considering the multiple options over free-agent seasons. Instead, the deal checks in more along the lines of dated extensions signed by Starling Marte, Jedd Gyorko and Gregory Polanco. Frankly, this seems like the type of deal that an agent would strongly advise his client not to take. Perhaps Albies simply wanted to take the largest guarantee the Braves were willing to offer; he received just a $350K signing bonus as a prospect, after all, and his career earnings to date may not even total seven figures. From a purely human standpoint, it’s hard for any 22-year-old player without much in the way of career earnings to rebuff $35MM under the guise that he’ll earn more on a year-to-year basis beginning 24 months down the line. Presumably, all of the points made here were spelled out to Albies before he made what amounts to a life-altering decision. The contract serves as a reminder that the teams hold overwhelming leverage in instances such as this, and the Atlanta organization took full advantage of that reality. It’s nothing short of a coup for the Braves to land Albies for a maximum of $45MM over the next nine years just weeks after Eloy Jimenez signed a deal that can pay him as much as $75MM over eight years before he ever played a single MLB game. Albies, meanwhile, entered his second full big league campaign in 2019 with a career .268/.317/.453 batting line to go along with 30 homers, 49 doubles, 10 triples and 22 stolen bases (in 26 attempts). He’s off to a fast start thus far, too, having posted a .929 OPS through the season’s first 11 games. Long one of the game’s top-ranked prospects, Albies earned what figures to be the first of multiple All-Star nods last year as part of a season that both Baseball-Reference and Fangraphs pegged at 3.8 wins above replacement. Given the output he’s already demonstrated to this point in his career, it seems unfathomable that Albies wouldn’t have taken home at least $10-15MM in arbitration, and the more realistic scenario (as evidenced by Schoop and Gennett) is that he’d have done quite a bit better. The Braves may very well try to spin the Acuna and Albies extensions as big expenditures that’ll buy some good will with fans after a quiet offseason in which they did not spend at anywhere near the level they implied to fans several months ago. And Braves fans, to be clear, should be thrilled by both deals. However, these types of deals aren’t the type that a team can legitimately claim as alternatives to spending in free agency and in taking on salary via trades; rather, they’re the type of contracts that should empower a team to spend in those arenas, knowing full well that paying market rate for other talent is offset by the overwhelming bargains they’ve secured over a pair of homegrown assets. Ken Rosenthal of The Athletic first reported the agreement (via Twitter). The New York Post’s Joel Sherman reported the terms (Twitter links), with Bob Nightengale of USA Today tweeting the annual breakdown.